The Albemarle County Comprehensive Plan calls for the division of the county into two categories: areas designated for development and areas that are rural in nature. The Designated Growth Area comprises five percent of the county and is largely clustered in the urban ring around Charlottesville. However, other pockets of development area outside the urban ring include Crozet and the Village of Rivanna. 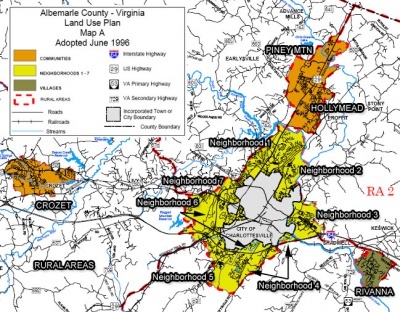 Albemarle County's Land Use Plan, a section of the County's Comprehensive Plan, designates 35 square miles of the County as Development Areas. The development of the designated growth areas is to be shepherded by the creation of Master Plans. Currently, the County has only adopted specific master plans for Crozet, the Pantops area and the Village of Rivanna. The Comprehensive Plan update in 2015 created an advisory council for the southern growth area to be known as the 5th & Avon Community Advisory Committee. Accommodate new growth in the county within the development areas. Encourage greater utilization of land in designated development areas by achieving higher gross densities for residential and non-residential development than in the past. Encourage infill development of vacant lands and development of under-used areas within the designated development areas. Development areas shall not encroach into water supply watersheds, except for the Crozet community, that shall not be expanded beyond the watershed boundary of the Lickinghole Creek detention basin. Avoid development of "Significant Areas" as designated in the Open Space Plan. Discourage extensive linear-style development along major roads. All development areas shall be served by public sewer and water. Plan for a system of transportation and community facilities and services that support and enhance the Development Areas. ↑ Albemarle County Land Use Plan, p.11, retrieved 11 Jul 2009. ↑ Web. Supervisors amend rules for master plan advisory groups, Sean Tubbs, Charlottesville Tomorrow, March 15, 2015, retrieved October 2, 2017. ↑ Web. Growth area expansion south of I-64 discussed, Sean Tubbs, Charlottesville Tomorrow, July 7, 2015, retrieved July 8, 2015. ↑ Web. Albemarle adjusts growth area boundary at potential brewery site, Sean Tubbs, Charlottesville Tomorrow, September 23, 2016, retrieved April 28, 2016. This page was last edited on 2 October 2017, at 10:53.